The official name of the territory is still simply the “Virgin Islands”, but the prefix “British” is often used. This is commonly believed to distinguish it from the neighbouring American territory which changed its name from the “Danish West Indies” to “Virgin Islands of the United States” in 1917. However, local historians have disputed this, pointing to a variety of publications and public records dating from between 21 February 1857 and 12 September 1919 where the Territory is referred to as the British Virgin Islands. British Virgin Islands government publications continue to begin with the name “The territory of the Virgin Islands”, and the territory’s passports simply refer to the “Virgin Islands”, and all laws begin with the words “Virgin Islands”. Moreover, the territory’s Constitutional Commission has expressed the view that “every effort should be made” to encourage the use of the name “Virgin Islands”. But various public and quasi-public bodies continue to use the name “British Virgin Islands” or “BVI”, including BVI Finance, BVI Electricity Corporation, BVI Tourist Board, BVI Athletic Association, BVI Bar Association and others. In 1968 the British Government issued a memorandum requiring that the postage stamps in the territory should say “British Virgin Islands” (whereas previously they had simply stated “Virgin Islands”), a practice which is still followed today. This was likely to prevent confusion following on from the adoption of US currency in the Territory in 1959, and the references to US currency on the stamps of the Territory. The ruins of St. Phillip’s Church, Tortola, one of the most important historical ruins in the territory. The islands were struck by Hurricane Irma on 6 September 2017, causing extensive damage, as well as four deaths in the BVI. A state of emergency was declared by the Caribbean Disaster Emergency Management Agency. The most significant damage was on Tortola. The UK’s Foreign Secretary Boris Johnson visited Tortola on 13 September 2017 and said that he was reminded of photos of Hiroshima after it had been hit by the atom bomb. HMS Ocean, carrying more extensive assistance, was not expected to reach the islands for another two weeks, however. Entrepreneur Richard Branson, a resident of Necker Island (British Virgin Islands), called on the UK government to develop a massive disaster recovery plan for British islands that were damaged. That should include “both through short-term aid and long-term infrastructure spending”, he said. Premier Orlando Smith also called for a comprehensive aid package to rebuild the BVI. On 10 September, PM Theresa May pledged £32 million to the Caribbean for a Hurricane relief fund; the UK government would also match donations made by the public via the British Red Cross appeal. Specifics were not provided to the news media as to the amount that would be allocated to the Virgin Islands. Boris Johnson’s visit to Tortola on 13 September 2017 during his Caribbean tour was intended to confirm the UK’s commitment to helping restore British islands but he provided no additional comments on the aid package. He did confirm that HMS Ocean (L12) was on the way to the BVI items like timber, buckets, bottled water, food, baby milk, bedding and clothing, as well as ten pickup trucks, building materials and hardware. The British Virgin Islands is a unitary territory. The territory is divided into nine electoral districts, and each voter is registered in one of those districts. 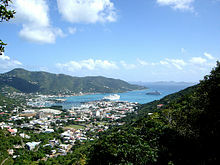 Eight of the nine districts are partly or wholly on Tortola, and encompass nearby neighbouring islands. Only the ninth district (Virgin Gorda and Anegada) does not include any part of Tortola. At elections, in addition to voting their local representative, voters also cast votes for four “at-large” candidates who are elected upon a territory-wide basis. Crime in the British Virgin Islands is comparatively low by Caribbean standards (and indeed compared to the neighbouring US Virgin Islands). Whilst statistics and hard data are relatively rare, and are not regularly published by governmental sources in the British Virgin Islands, the Premier did announce that in 2013 there has been a 14% decline in recorded crime as against 2012. Homicides are rare, with just one incident recorded in 2013. The British and US Virgin Islands sit at the axis of a major drugs transshipment point between Latin America and the continental United States. The American DEA regards the adjacent US territories of Puerto Rico and the US Virgin Islands as a “High Intensity Drug Trafficking Area”. A co-operation agreement exists between the British Virgin Islands and the US Coast Guard allowing American forces to pursue suspected drug traffickers through the territorial waters of the British Virgin Islands. In August 2011 a joint raid between the American DEA and the Royal Virgin Islands Police Force arrested a number of British Virgin Islands residents who are accused of being involved in major drugs transshipments, although their extradition to the United States has become bogged down in protracted legal wrangling. The average monthly income earned by a worker in the territory was US$2,452 as at the time of the 2010 Census. 29% of the population fell into the “low income” category. Although it is common to hear criticism in the British Virgin Islands’ press about income inequality, no serious attempt has been made by economists to calculate a Gini coefficient or similar measure of income equality for the territory. A report from 2000 suggested that, despite the popular perception, income inequality was actually lower in the British Virgin Islands than in any other OECS state, although in global terms income equality is higher in the Caribbean than in many other regions. The “twin pillars” of the economy are tourism and financial services. Politically, tourism is the more important of the two, as it employs a greater number of people within the territory, and a larger proportion of the businesses in the tourist industry are locally owned, as are a number of the highly tourism-dependent sole traders (for example, taxi drivers and street vendors). Economically however, financial services associated with the territory’s status as an offshore financial centre are by far the more important. 51.8% of the Government’s revenue comes directly from licence fees for offshore companies, and considerable further sums are raised directly or indirectly from payroll taxes relating to salaries paid within the trust industry sector (which tend to be higher on average than those paid in the tourism sector). Tourism accounts for approximately 45% of national income. The islands are a popular destination for US citizens. In 2006 a total of 825,603 people visited the islands, of whom 443,987 were cruise ship passengers. Tourists frequent the numerous white sand beaches, visit The Baths on Virgin Gorda, snorkel the coral reefs near Anegada, or experience the well-known bars of Jost Van Dyke. The BVI are known as one of the world’s greatest sailing destinations, and charter sailboats are a very popular way to visit less accessible islands. Every year since 1972 the BVI has hosted the Spring Regatta, which is a seven-day collection of sailing races throughout the islands. A substantial number of the tourists who visit the BVI are cruise ship passengers, and although they produce far lower revenue per head than charter boat tourists and hotel based tourists, they are nonetheless important to the substantial – and politically important – taxi driving community. Only Virgin Islanders are permitted to work as taxi drivers. Financial services account for over half of the income of the territory. The majority of this revenue is generated by the licensing of offshore companies and related services. The British Virgin Islands is a significant global player in the offshore financial services industry. In 2000 KPMG reported in its survey of offshore jurisdictions for the United Kingdom government that over 45% of the world’s offshore companies were formed in the British Virgin Islands. Since 2001, financial services in the British Virgin Islands have been regulated by the independent Financial Services Commission. On June 30, 2014, The British Virgin Islands was deemed to have an Inter- Governmental Agreement (IGA) with the United States of America with respect to the “Foreign Account Tax Compliance Act” of the United States of America. The Government of Great Britain and Northern Ireland provided a copy of the Letter of Entrustment which was sent to the Government of the British Virgin Islands, to the Government of the United States of America “via diplomatic note of May 28, 2014”. The Letter of Entrustment dated July 14, 2010 was originally provided to the Government of the British Virgin Islands and authorized the Govt of the BVI “to negotiate and conclude Agreements relating to taxation that provide for exchange of information on tax matters to the OECD standard” (Paragraph 2 of the FATCA Agreement). Via an “Entrustment Letter” dated March 24, 2014, The Govt of Great Britain and Northern Ireland, authorized the Govt of the BVI to sign an agreement on information exchange to facilitate the Implementation of the Foreign Account Tax Compliance Act. On March 27, 2017, the US Treasury site disclosed that the Model 1 agreement and related agreement were “In Force” on July 13, 2015. Agriculture and industry account for only a small proportion of the islands’ GDP. Agricultural produce includes fruit, vegetables, sugar cane, livestock and poultry, and industries include rum distillation, construction and boat building. In recognition of the CARICOM (Free Movement) Skilled Persons Act which came into effect in July 1997 in some of the CARICOM countries such as Jamaica and which has been adopted in other CARICOM countries, such as Trinidad and Tobago, it is possible that CARICOM nationals who hold the “A Certificate of Recognition of Caribbean Community Skilled Person” may be allowed to work in the BVI under normal working conditions. Unusually, the territory has one of the highest drowning mortality rates in the world being higher than other high risk countries such as China and India. 20% of deaths in the British Virgin Islands during 2012 were recorded as drownings, all of them being tourists. Despite this, the territory’s most popular beach still has no lifeguard presence. The traditional music of the British Virgin Islands is called fungi after the local cornmeal dish with the same name, often made with okra. The special sound of fungi is due to a unique local fusion between African and European music. It functions as a medium of local history and folklore and is therefore a cherished cultural form of expression that is part of the curriculum in BVI schools. The fungi bands, also called “scratch bands”, use instruments ranging from calabash, washboard, bongos and ukulele, to more traditional western instruments like keyboard, banjo, guitar, bass, triangle and saxophone. Apart from being a form of festive dance music, fungi often contains humorous social commentaries, as well as BVI oral history. ^ According to the Virgin Islands Constitution Order, 2007, the territory’s official name is simply ‘Virgin Islands’. ^ Although under Council Regulation No. 1932/2006 BOTCs “without the right of abode in the UK” were classified as non-EU nationals, the conferment of British citizenship in 2002 means most BOTCs acquired the right of abode in the United Kingdom along with British citizenship and hence are not considered by the EU as third-country nationals. ^ a b Moll, Peter (15 December 2016). “Victorian news mined for VI history”. BVI Beacon. ^ “About the Territory”. Government of the Virgin Islands. Retrieved 31 March 2015. ^ “Virgin Gorda historic weather averages in British Virgin Islands”. Intellicast. Retrieved 4 July 2012. ^ a b “Richard Branson ‘devastated’ about Hurricane Irma destruction”. 7 September 2017. ^ CNN, Eliza Mackintosh and Donie O’Sullivan,. “Don’t forget about us: Irma’s desperate Caribbean survivors”. ^ a b “Subscribe to read”. Financial Times. ^ Bosotti, Aurora (8 September 2017). “Hurricane Irma damage UPDATE: British Virgin Islands Destroyed by deadly storm”. Daily Express. ^ “Paradise lost: Tortola seeks UK aid after Irma”. ^ “Boris Johnson reminded of Hiroshima on visit to Irma-hit Tortola”. ^ (now), Naaman Zhou; Yuhas, Alan; Weaver, Matthew; Farrer, Martin; (earlier), and Martin Pengelly; Pilkington, Ed (12 September 2017). “Caribbean in chaos as Irma brings floods to Florida Keys – as it happened” – via www.theguardian.com. ^ Farmer, Ben; Swinford, Steven (8 September 2017). “British response to Hurricane Irma ‘found wanting’, senior MPs say, as Royal Navy arrives in Caribbean” – via www.telegraph.co.uk. ^ (now), Naaman Zhou; Yuhas, Alan; Weaver, Matthew; Farrer, Martin; (earlier), and Martin Pengelly (12 September 2017). “Caribbean in chaos as Irma brings floods to Florida Keys – as it happened” – via www.theguardian.com. ^ CNN, Hilary Clarke and Samantha Beech,. “European leaders step up Irma relief effort in Caribbean”. ^ Siddique, Haroon; Pengelly, Martin (11 September 2017). “What we know so far as Hurricane Irma lashes Florida” – via www.theguardian.com. ^ “French, British officials view Irma’s damage, vow island aid”. 14 September 2017. Archived from the original on 14 September 2017. Retrieved 13 September 2017. ^ Stinson, Nicole (14 September 2017). “Hurricane Irma: British marines hunt Caribbean prison inmates after storm jailbreak”. ^ “Explanatory Memorandum to the Virgin Islands Constitution Order 2007” (PDF). ^ “The Virgin Islands Constitution Order 2007”. ^ “Which Caribbean Islands are the Safest, Most Dangerous?”. About.com. Retrieved 18 November 2013. ^ “Crimes down by 14% – Premier”. BVI News. 13 January 2014. ^ “How safe is the Caribbean? An Island by Island Look”. International Business Times. 22 December 2011. ^ “US sees shift in cocaine trafficking”. BVI Beacon. 9 February 2012. ^ US Justice Department (25 August 2011). “Thirteen Indicted for Airdropping Multi-Hundred Kilogram Quantities of Cocaine in the Caribbean Sea and for Money Laundering Offenses”. Archived from the original on 9 May 2012. Retrieved 19 March 2012. ^ “Three Years On & Extradition Proceedings Still Unsettled”. BVI Platinum. 8 September 2014. ^ Fox, Ben (2009-05-09). “Islands resent crackdown of the tax havens by G-20”. Associated Press. Archived from the original on 2009-05-15. Retrieved 2016-04-02. ^ “List of Banks in British Virgin Islands”. thebanks.eu. ^ “Annual Report 2012 (Final)”. bvifsc.vg. Archived from the original on 6 October 2014. Retrieved 3 October 2014. ^ Leigh, David; Frayman, Harold; Ball, James (25 November 2012). “Offshore secrets: British Virgin Islands, land of sand, sea and secrecy”. The Guardian. Retrieved 29 April 2015. ^ International Adviser (12 September 2013). “Jersey, Guernsey, IoM revel in Cameron’s ‘not tax havens’ comments”. Archived from the original on 17 November 2013. Retrieved 17 November 2013. BBC News (10 September 2013). “David Cameron: Crown dependency tax haven banner ‘not fair‘“. ^ Karmanau, Yuras (April 4, 2016). “Ukrainian president under fire over Panama Papers”. Associated Press. Retrieved April 4, 2016. ^ “Foreign Account Tax Compliance Act (FATCA)”. www.treasury.gov. ^ a b “Overseas territories to fight public register demands”. ^ a b The Times. “British Virgin Islands – workforce”. Retrieved 2012-03-19. ^ Secretariat, CARICOM. “Country Profile for British Virgin Islands —Caribbean Community (CARICOM) Secretariat”. caricom.org. ^ Secretariat, CARICOM. “Caribbean Community (CARICOM) —Caribbean Community (CARICOM) Secretariat”. caricom.org. ^ “: Caribbean Single Market Economy (CSME) :. :: Ministry of Labour and Social Security ::.:”. www.mlss.gov.jm. ^ Security, Immigration Division Ministry of National. “CSME”. immigration.gov.tt. ^ “British Virgin Islands (British Overseas Territory) travel advice – GOV.UK”. fco.gov.uk. ^ ““Drowning”, publication World Health Organization” (PDF). ^ a b The BVI Beacon, Thursday, August 15, 2013 article entitled “Report: Passports up, marriages down last year”. ^ Annual Report of the Civil Registry and Passport Office for 2012 which includes “For the 20 percent that represented drowning, all were tourists who died from snorkelling or diving in the VI waters in and around caves at Norman Island, as well as near Virgin Gorda…The Virgin Islands should, therefore put safety measures in place such as the dissemination of information to hotels, dive shops and marinas.” The same report confirms that the deaths of 86 persons were recorded in the Territory during 2012. ^ “No lifeguards at Cane Garden Bay & Virgin Gorda beaches”. virginislandsnewsonline.com. ^ “The Open Campus in British Virgin Islands – Open Campus”. open.uwi.edu. ^ a b “National Population Census Report 2001 – The British Virgin Islands” (PDF). Caribbean Community Secretariat. 2009. Retrieved 2012-03-07. ^ cited in “Mapping the Global Muslim Population” (PDF). Pew Forum on Religion and Public Life. 2009. Archived from the original (PDF) on 21 August 2011. Retrieved 7 March 2012. ^ “BVI Book Of Poetry Set For Year End Reveal”. ^ “The Best Sailing”. Retrieved 2011-12-16. “Non-Self-Governing Territories listed by General Assembly in 2002”. United Nations Special Committee of 24 on Decolonization. Retrieved 10 March 2005. “British Virgin Islands”. The World Factbook. Central Intelligence Agency.